AJA International ATC Flagship Series Sputtering Systems are versatile PVD coating tools which can be built in a variety of configurations to satisfy most requirements. 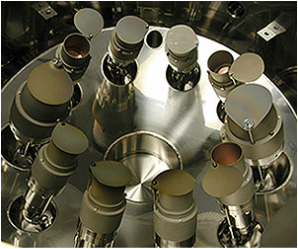 These systems are built around AJA's unique A300-XP (UHV) or Stiletto Series (HV) magnetron sputtering sources which feature in-situ source head tilting allowing precise and repeatable con-focal, direct, and off-axis thin film deposition. 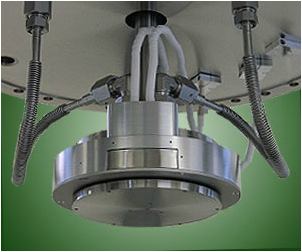 All systems include a heavy duty hoist to lift the chamber top for system access. (e-beam evaporation, thermal evaporation and PLD) , ion sources, facing target sputtering sources (FTS), contact masking systems, metal-sealed tops, bake jackets, glove boxes, cassettes, auto-loading and analytical tools (RHEED, XPS, Auger, RGA, Ellipsometers and MOS). Labview based computer control and either turbomolecular or cryopumping are utilized depending on the application. 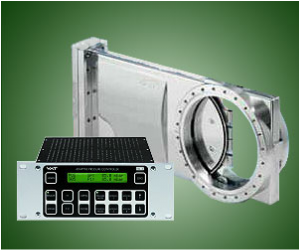 ATC Flagship Systems can also be easily connected to each other or to ATC Orion Systems for multi-chamber (e.g. metal/oxide) or multi-technique (e.g. 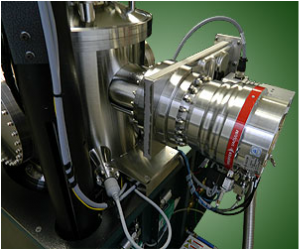 sputter/e-beam evaporation/thermal evaporation/PLD/ion milling/analytical) configurations. (5) con-focal A320-XP 2" UHV sputter sources with in-situ tilt, (1) normal incidence A330-XP-3” UHV sputtering source for high rate applications, CTI-8 cryopump, 850°C rotating substrate heater with RF bias, computer control & load-lock for 100 mm Ø substrates. (6) A330-XP 3" UHV sputter sources with in-situ tilt, 1200 l/s turbopump, 800°C, rotating substrate heater with RF bias, computer control and automated (9) substrate cassette elevator in the load-lock for 150 mm Ø substrates. 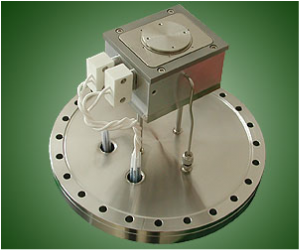 (6) A330-XP (3" target) in-situ tilt, sputter sources are employed to deposit a circular array of discrete, combinatorial dots onto wafers or 156 mm square glass substrates. The same system can also be used to deposit continuous gradients from up to six directions simultaneously. 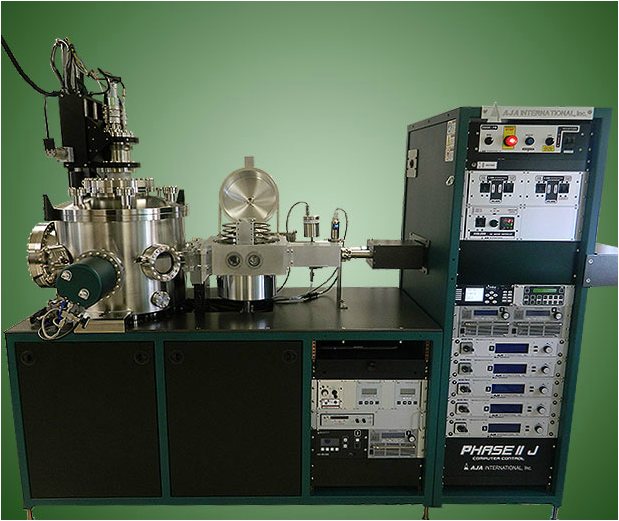 (11) Source GMR/MTJ research system with auto-loading and 6 position cassette. 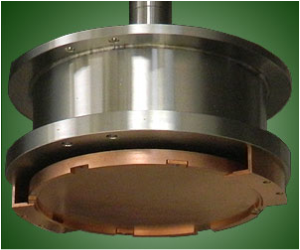 High rate direct sputter Turret Coater for 4" wafers. 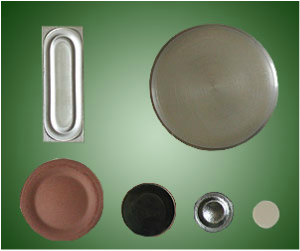 Wafers can be flipped in-situ and coated on both sides. Turret incorporates (4) STX-150 (6") magnetron sources and a 1000 W RF power supply/matchbox with integral, automatic, (4) way switchbox. (12) Source direct sputter coater for (8) 1" samples. 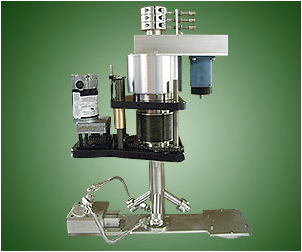 Sample positioning is stepper motor controlled and programmable. 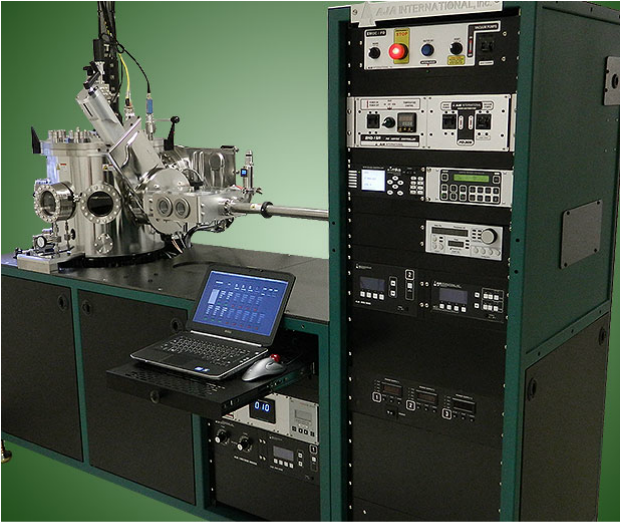 The ATC Series Thin Film Deposition Systems can be configured for con-focal, direct, and off-axis deposition. 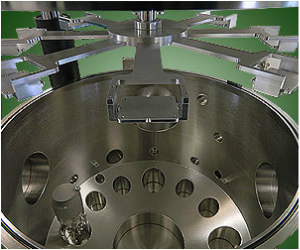 Con-focal deposition with in-situ tilt sputter sources (AJA pioneered and developed this concept in 1991) can deliver uniformity of better than +/- 2% on substrates twice the diameter of the targets. Often +/- 1% or better is achievable. A typical deposition profile with SiO(2) on a 6" diameter Si wafer is shown. 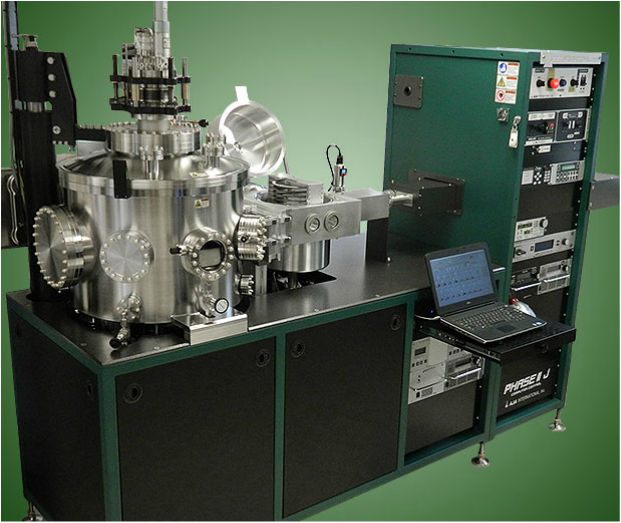 Deposition rate is a function of sputter yield of the material, maximum allowable power density into the target (depends on heat transfer capability of target material), and type of power used (e.g. RF, DC, pulsed DC). 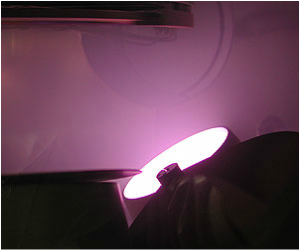 Maximum deposition rates are achieved with materials such as Au - high sputter yield, excellent heat transfer material and can be sputtered with DC (most efficient). 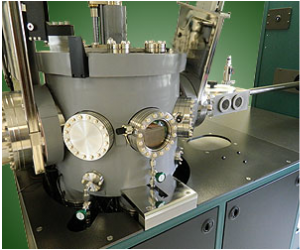 Slow deposition rates can be expected with materials such as Al2O3 - very low sputter yield, poor heat transfer material and must be sputtered with RF (1/2 the efficiency of DC). Typical rates are 0-18 Å/sec with Au, 0-9 Å/sec with Cu and 0-0.16 Å/sec with Al2O3 in a confocal configuration with 2" sources on a 100 mm diameter substrate. Off-axis deposition rates are typically 1-5 times lower than con-focal deposition rates depending on substrate size and system configuration. Direct deposition at short working distances (50-100 mm) can achieve rates as high as 300 Å/sec but con-focal geometry results in much better uniformity, the ability to co-deposit alloy films and the ability to grow better ultra-thin film multilayers since the substrate is always "in the plasma." 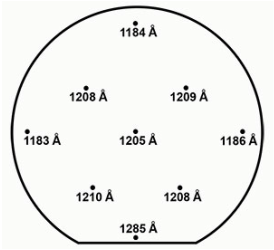 The cost of the smaller targets employed in con-focal configurations can also significantly reduce operating cost. The ultimate system configuration offered will always depend on the application. deposition onto 150 mm Ø substrate. +/- 1.17% uniformity over 140mm diameter. 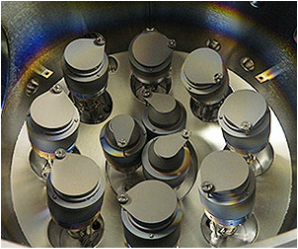 AJA's exclusive Stiletto (HV) and A300 (UHV) Series Magnetron Sputtering Sources are designed for maximum application flexibility. 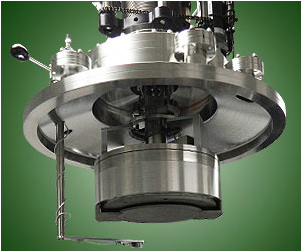 These unique sources feature a modular magnet array which can be configured by the customer to operate in the balanced, unbalanced (Type II) and magnetic material modes. Gas injection chimneys and shutter systems are incorporated to facilitate in-situ tilting and prevent cross-contamination and target poisoning. 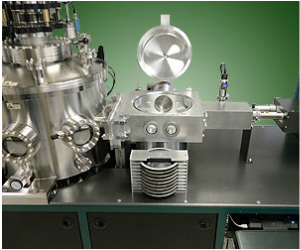 3" and 4" sources can be operated at pressures below 4 x 10-4Torr in combination with an ion source to perform IBAD at half the price and complexity of an ion beam assisted ion beam sputtering system. 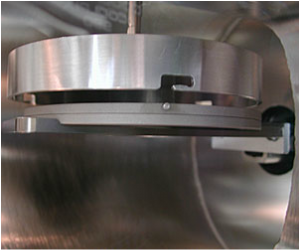 For angled sputtering configurations with rotating substrates, AJA International Inc. sputtering sources can be fitted with the “in-situ tilt” option. 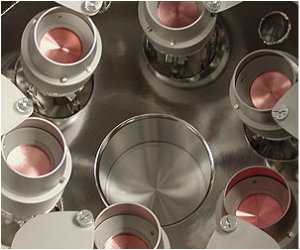 This option, shown at the left, allows the source angle to be precisely adjusted from outside the vacuum chamber. Fine tuning the incident angle is critical to achieving good deposition uniformity when working distances, operating pressures and materials are changed. When fixed angle arrangements limit and often compromise the capabilities of a system, “in-situ tilt” can deliver better than +/- 2% uniformity on substrates which can be up to triple the diameter of the source targets. The ATC Series Thin Film Deposition Systems are available with either motorized, rotating, substrate holders (for con-focal configurations) or "T" arm substrate holders (for direct deposition). AJA's experienced design and manufacturing team also offers custom substrate holders to satisfy unique requirements. 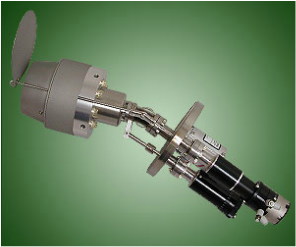 SHQ and SiC Series substrate heaters can achieve temperatures of up to 1000°C and can be fitted with reactive gas injection rings, substrate RF/DC bias capability for pre-cleaning and ion assisted deposition, in-situ manual or motorized Z motion for working distance adjustment and load-lock transfer, transverse magnetic field with in-situ orientation adjustment between layers and in-situ mask exchange (available with certain configurations). Indexing for "T" arms and for gradient depositions on rotating holders is accomplished with precise stepper motor systems. Electronic triggers for analytical applications are also available. 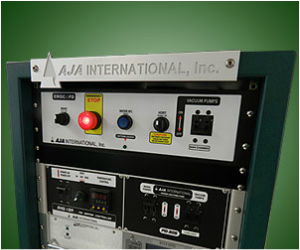 AJA manufactures its own PID based temperature controllers and joystick actuated motor controllers for rotation and Z motion. AJA SHQ Series substrate heaters utilize cost effective, durable, fast cycling, quartz halogen lamp technology while the highest temperatures are achieved with Silicon Carbide elements. 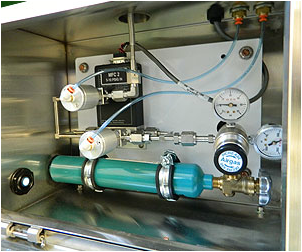 Custom cooled substrate carriers (water/LN2) are also available depending on the requirement. with load-locks and both manual and automated loading systems. eliminate the protrusion of mounting clips. Z- motion for 100 mm Ø substrates. 800°C for 150mm Ø substrates featuring motorized Z-motion, rotation and a swing-in QCM for rate calibration. has 1000°C heating with RF biasing, the other side incorporates water cooled heat sinking to cool down substrates before exposure to air. 1000°C for 1.5" Ø substrates featuring transferable substrate carrier and gas injection frame. 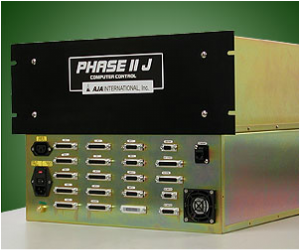 The AJA Labview based Phase II-J Computer Control System is used on all ATC Flagship Series Sputtering Systems. 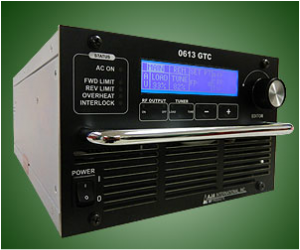 This straightforward, user friendly control system utilizes a large screen laptop in a 19” rack drawer connected to a single 4U rack mount hardware module. The back panel of the hardware module is populated with connectors to interface to all aspects of the sputtering system and to allow for easy future "plug and play" upgrades/expansions. 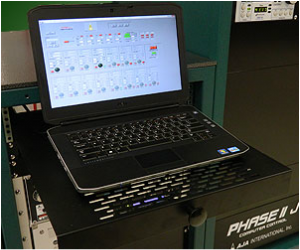 The Phase II-J control system allows the user to operate in either the “manual mode” or the “automated processing mode”. In the “automated processing mode” the user designs "process layers” which are then compiled and saved as a “process” to be executed with a single command. The system allows up to 104 unique user entry points which are accessible only by password, limiting access to a user’s process layers and thereby preventing unexpected corruption of a user’s saved processes. Data-logging to a Microsoft Excel spreadsheet is standard and is available with an adjustable refresh period. Remote preparation of new processes in a spreadsheet emulator format is available as an option. 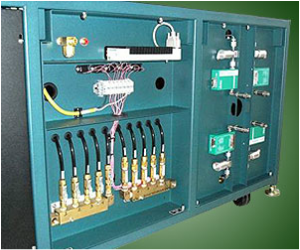 The standard Phase II-J control system will accommodate up to (5) DC power supplies, (4) RF power supplies, (1) 4-way DC switch-box, (1) 4-way RF switch-box, (4) process gases, (16) Valves/shutters, closed loop automatic pressure control, substrate rotation and substrate temperature control. Processes are aborted if plasma is not detected. Special “soak layers” can be easily incorporated into the process.